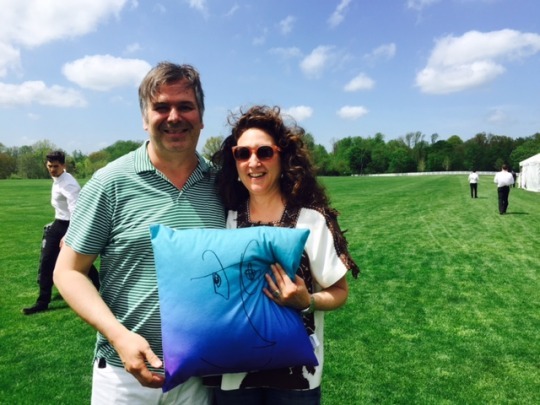 Rob Pruitt with Wendy, holding a pillow depicting Pruitt’s gradient face painting STUPID, 2012. At the opening of Rob Pruitt’s 50th Birthday Bash exhibition at The Brant Foundation in Greenwich, CT, visitors were greeted by a flowering carpet highlighting the artist’s name. The carpet traveled inside to a huge flea market, the proceeds of which benefited the Center for Curatorial Studies at Bard. All manner of personal Brant-family paraphernalia was for sale, along with custom-made pillows depicting Pruitt’s gradient face paintings. A parade of self-portraits surrounded the shoppers, while upstairs viewers were treated to a chorus line of cement-filled jeans. Pruitt’s silvered tire-towers and paintings of glittering pandas touch an elemental chord, you simply have to love them! 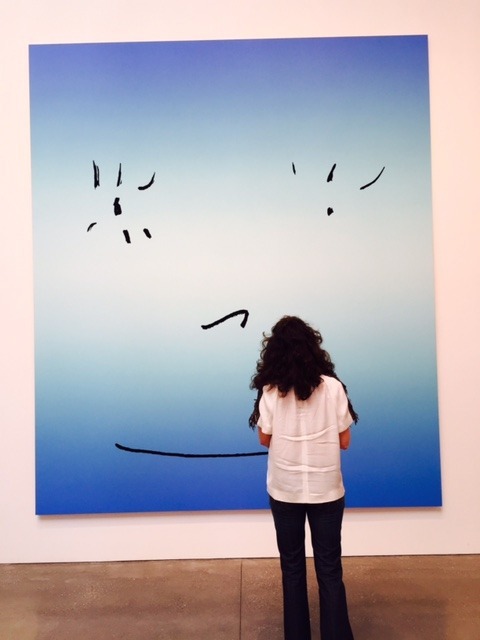 Wendy pondering Pruitt’s Bright Eyes, 2015. Wendy and Pruitt’s Espirit de Corps (Hokusai’s Great Wave), 2015. 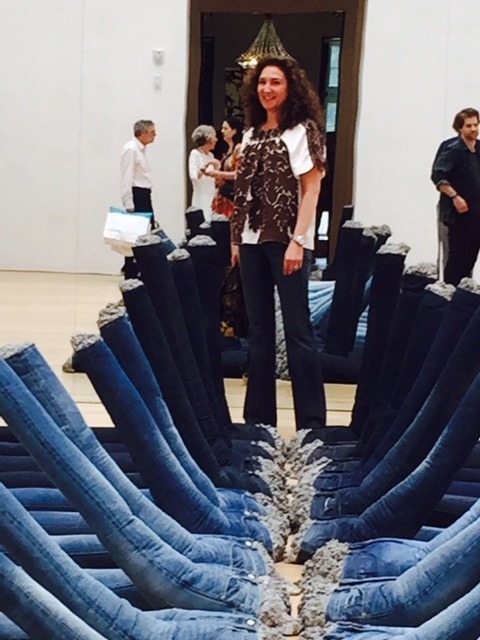 “Out and About” is a monthly blog where art advisor Wendy Cromwell shares insights from over twenty years of experience and art historical research. Here, you will find everything from commentary on current market trends and advice from industry professionals to behind-the-scenes access to exhibitions and studio visits with artists.